MPSC Civil Judge Prelims Admit Card 2019 is Released….!! The Maharashtra Public Service Commission authority is going to conduct the Maharashtra Civil Judge Preliminary Examination on 7th April 2019. For this purpose, the officials issued the Maharashtra Civil Judge Hall Ticket on 28th March 2019 @ mpsc.gov.in. So, candidates who are willing to participate in the written test, they must download the MPSC Civil Judge Junior Division Call Letter 2019 from this article. The MPSC Civil Judge Admit Card 2019 is a mandatory document for the written examination. So all the competitors must carry the Maha PSC Civil Judge Hall Ticket 2019 for the test center. At the end of this page, we have given a direct link to download the MPSC Civil Judge Admit Card 2019. The MPSC Civil Judge Admit Card 2019 plays an important role at the time of examination. The Maharashtra Public Service Commission authority had released a recruitment notification for 190 Civil Judge Junior Division posts. For this recruitment, the application process started on 1st February 2019 and the end date on 21st February 2019. A massive number of candidates are interested to apply for these vacancy posts. The MPSC authority decided to conduct the selection rounds for the applicants. Aspirants who will give the best performance in the entire recruitment process, they will be recruited by the MPSC authority. The Maharashtra Public Service Commission officials are going to conduct the MPSC Civil Judge Preliminary Examination on 7th April 2019 and the Main Examination on 18th August 2019. There is a limited time for the written examination. So aspirants without wasting the valuable time must focus on your preparation to get good marks in the written examination. The MPSC Civil Judge Admit Card 2019 is available through online mode. Applicants need to download it by using the login credential information. For more updates keep following Sarkari Recruitment on a daily basis. Candidates need to carry any one of the documents from the below given list along with MPSC Civil Judge Admit Card 2019 for security purpose. Maharashtra Public Service Commission main page will open. 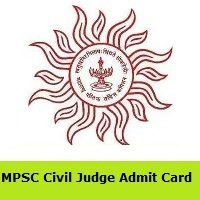 Find the MPSC Civil Judge Admit Card 2019 direct link on the homepage. One page will open about login details. Enter Registration ID, Date of Birth details. After that cross check all given data and submit them. As per given info the MPSC Civil Judge Admit Card 2019 will open. Check all printed information on the Call Letter and download it. Take a print out of Admit Card to carry for the exam.